The Calicut Heroes, led by Jerome Vinith who scored 16 points, managed a bonus point for their whitewash. 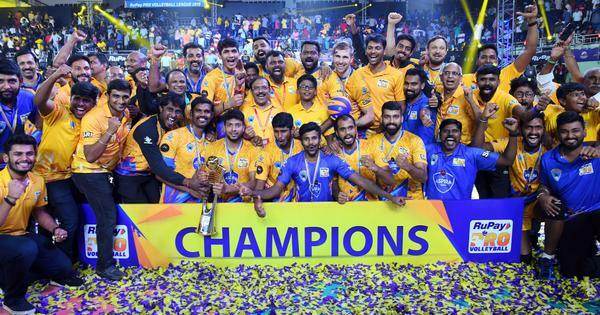 Calicut Heroes defeated Kochi Blue Spikers 5-0 (15-11, 15-9, 15-14, 15-13, 15-10) with a bonus point from the much-anticipated Kerala Derby on Saturday in front of a packed house in Kochi. Skipper Jerome Vinith led from the front for Calicut with 16 points (14 spikes and 2 serves). K Praveen Kumar put up a valiant effort for Kochi with 10 points (9 spikes and 1 block). Calicut started the first set not winning points just on attack but with their immaculate defence as they raced to an 8-4 lead entering the first Technical Time Out. Ajith Lal, Paul Lotman, Iluoni Ngampourou and skipper Jerome Vinith led the scoring for Calicut. Right after the TTO, Calicut called for a Super Point but Lal put up a bad serve. Kochi looked like making a comeback as they closed the gap to 9-11 and called for a Super Point but a misdirected spike from David Lee reinstated a four-point lead for Calicut and they closed the set 15-11 with an inch perfect spike from skipper Vinith. Calicut were looking unstoppable as they did not give Kochi an inch of breathing space and cut through the opponent’s defence with consistent attack and serving. At TTO, Calicut lead 8-1. Kochi looked completely out of sorts and had no answer to Calicut’s power play as they took a 2-0 lead in the match, winning the set 15-9. It seemed like a similar story of the previous two sets as Calicut led 4-0 before a spike from K Praveen Kumar gave Kochi their first point. Kochi looked like finding their rhythm finally and called for a Super Point on Calicut’s serve at 4-7 and won it to reduce the gap to 6-7. Calicut now called for a Super Point and an error by Prabagaran S gave the point to Calicut making it 9-6 in Calicut’s favour going into the TTO. 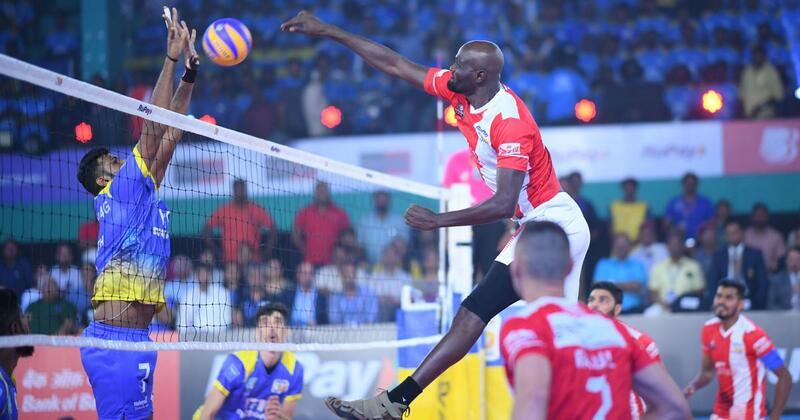 Kochi showed their grit and from being 12-14 down levelled the score at 14 -14, but that wasn’t enough as Iluoni ended the set with a spike to give Calicut an unassailable 3-0 lead in the match. It looked more like a competition in the fourth set as both teams countered each other’s moves. The point advantage was never more than one point till 9-8 when an error by Ukkrapandian and a serve point by Lotman gave Calicut an 11-8 lead. Kochi came back to level the score at 13-13 benefitting from Karthik’s serve error on Calicut’s Super Point. Calicut won the set 15-13 as the packed house looked at the possibility of the first white-wash of the season. Kochi spent the fifth set chasing Calicut’s lead. At 3-6 Kochi called from a Super Point and won it on Calicut’s serve. Immediately, Calicut called for a Super Point and won the same with a spike from skipper Vinith. 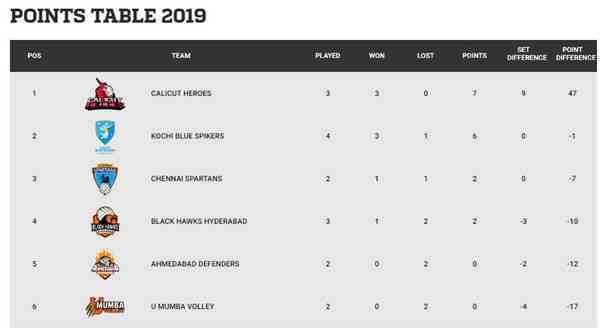 It was Calicut’s day completely as they won the fifth set in style closing the match with a Super Serve by Karthik A.
Calicut Heroes will take on Black Hawks Hyderabad on February 10.